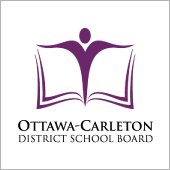 The Ottawa-Carleton District School Board (OCDSB, known as English-language Public District School Board No. 25 prior to 1999) refers to both the institution responsible for the operation of all English public schools in the city of Ottawa, Ontario and its governing body. Like most school boards, the OCDSB is administered by a group of elected trustees and one director selected and appointed by the Board itself. Additionally, annually, two student trustees are selected per provincial regulation. The OCDSB has 147 school sites (117 elementary, 25 secondary including the Adult High School, plus five secondary alternate sites). Schools within the OCDSB provide English with Core French, Alternative, Early French Immersion, Middle French Immersion, Late French Immersion, Special Education, IEP's and Gifted program.